Fogo Island is the largest of the offshore islands of Newfoundland and Labrador, Canada. It lies off the northeast coast of Newfoundland, northwest of Musgrave Harbour across Hamilton Sound, just east of the Change Islands. In 2011 the island had a population of 2,395. Fogo Island is one of the oldest named features on the coast of Newfoundland. Beothuk Indians traversed Fogo Island for many hundreds of years before Irish and English settlers arrived. The Beothuk pursued the seal and salmon fisheries in the area. Fogo Island is connected to mainland Newfoundland by the ferry MV Veteran, and served by Fogo Aerodrome. 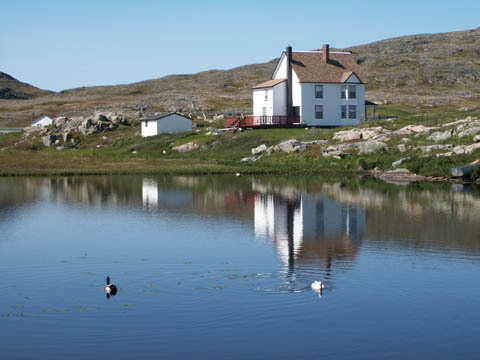 Fogo Island has a marine-based cold humid continental climate bordering on subarctic with cooler summers than inland areas of Newfoundland as well as milder winters than areas on the same parallels in interior Canada. However, due to the very cool characteristics of summer months. Fogo Island is home to Fogo Island Inn, an inn located in Joe Batt's Arm, that includes 29 guest suites, a critically acclaimed restaurant, a library, a cinema and an art gallery.